The Central Park Arsenal, built 1847-51. It served only briefly as an actual arsenal; after 1853 it was a police precinct house, the American Museum of Natural History, a menagerie, an art gallery, the Municipal Weather Bureau, a restaurant, and finally in 1914, the Manhattan Parks Department. In 1934, the five boroughs' Parks Departments were consolidated into a unified City-wide Parks Department and the Arsenal was completely renovated by Depression-era relief labor (i.e. the New Deal) and the lobby walls literally covered from floor to ceiling with murals by the WPA's Director of Murals for the NYC Parks Department, Allen Saalburg. The WPA also made a new main entrance with miltary-motif decorations (next image). The architect for the project was Aymar Embury II who was the chief designer of an almost endless series of NYC New-Deal creations (as the Wikipedia article just cited says, "it is possible that Embury supervised the design of over six hundred public projects"). 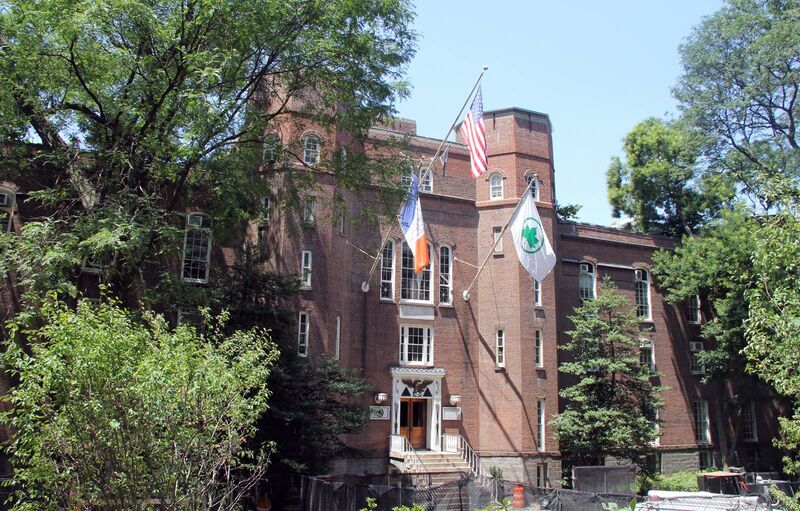 When Embury took on the Arsenal, it was covered with ugly gray stucco; he had it "blasted off to reveal the handsome red bricks" and then designed the Central Park Zoo to harmonize with it. More about Embury in the footnotes section of this page. Central Park Arsenal History, NY Department of Parks Website. Thomas Jefferson Play Center, Landmarks Preservation Commission, July 24, 2007 Designation List 394 LP-2236: ”When Moses took over the Parks Department, it was already employing 69,000 relief workers funded mainly by the federal Civil Works Administration (CWA) and the Temporary Emergency Relief Administration (TERA).” This is the best explanation I have found so far of how the Arsenal was renovated for the new unifed Parks Department. The 1851 Central Park Arsenal at the Daytonian in Manhattan website (historic images). Scheier, Joan, The Central Park Zoo, Arcadia Publishing (2002), p.45. Gray, Christopher, "From Armory to Zoo to Museum to Offices", New York Times, November 18, 2007: "At that time  a designer installed the military touches that can still be seen at the front door, with cannon balls, military drums and, as stair balusters, cast-iron muskets. Adrian Benepe, commissioner of parks and recreation, said he was sure the designer must have been Aymar Embury II, a staff architect for the department in the 1930s and 1940s, because 'he was such a historicist.'" Embry worked for Moses but he was paid by the New Deal (CWA and then WPA).